Andreas Kloppmann is particularly fond of the HB 57 set. The dark, smokey tone of a '57 gold top had once befallen him. It was something else, heavier than the Les Pauls he had known so far. Dickey Betts, Snowy White and the legendary Slide Maestro Duane Allman are famous users of '57 Gold Tops. The neck pickup sounds somewhat "lighter and clearer" than the bridge pickup. Each HB pickup comes with 2 springs, 2 mounting screws and a sound condenser! Andreas Kloppmann has worked for years to achieve his good name. Since mid-1980 he has collected and archived data of pickups. Many findings were won through measuring but also unwinding defective pick ups to see how much of what was wound where. Each Kloppmann pickup is hand wound individually in a winding machine from the 1960s and the wire is guided by hand. The number of turns is counted mechanically. Based on years of experience, important sonic parameters can be determined during the winding process. Using a comprehensive database - full of the frequency response curves of different pickups - different products are manufactured and their characteristics compared with those of their counterparts. According to the measured data and the frequency response curve the intended destination of the pickup is then assigned. 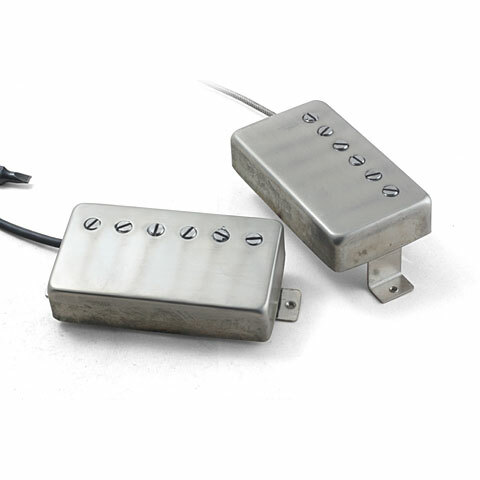 (Neck, middle, bridge, hot, vintage or similar) Every pickup gets a production number and their individual data is stored. With this method, there is always the possibility of becoming an identical product from the production line. And for those who do not believe in measuring results and frequency curves: Andreas Kloppmann has been an active musician for more than 25 years (guitarist, of course), connoisseur of vintage instruments and controls his products, of course, by ear. · Show all articles of the brand Kloppmann.